In January 2018 the lovely Heather at Vegan Eats Oxford kindly wrote us up a guest post from a Vegan perspective on this fairly new restaurant in St Clements. What baffled me is how, when they have a moderately priced menu and the two restaurants ranked above them are considerably more expensive? I had to go down there and see what it was like for myself. When you walk into the Coconut Tree you are greeted with a busy yet chilled vibe with deep bass notes playing on their sound system. We arrived on a Friday evening at 19:00 and almost every table was taken which is always a good sign. Soon after walking in we were escorted to our table. If you reserve your table in advance they provide you with a nice little chalk board with your name and the time of your booking written on it, which we thought was a really nice touch. 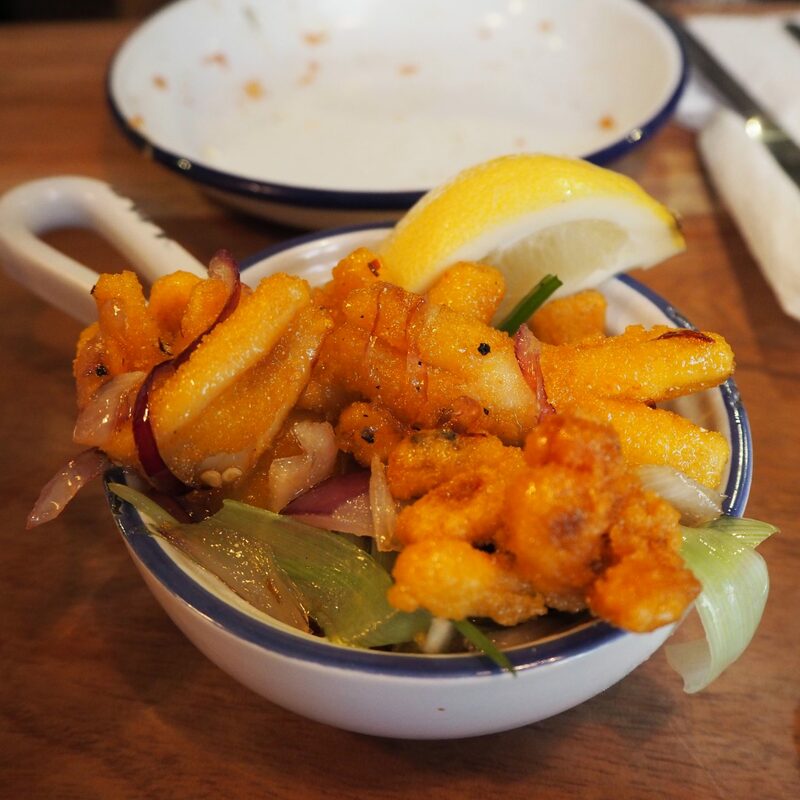 The food at The Coconut Tree is very much tapas style where you pick lots of small dishes to share in a casual dining environment and something to note is that the waiters and waitresses bring out dishes as and when they are ready from the kitchen, in no specific order. So if I had to describe a Hopper in my own words it would be exactly how it looks, a cracked egg inside a pancake with spices and a fresh kick to it. If you were to list these items separately they don’t seem that exciting but when they are put together they work strangely well and it’s a light dish, so great for something at the beginning of your meal. Assuming you try a Hopper, I was told the best way to eat one is by mixing everything into the egg, folding the pancake and enjoy as we did above! 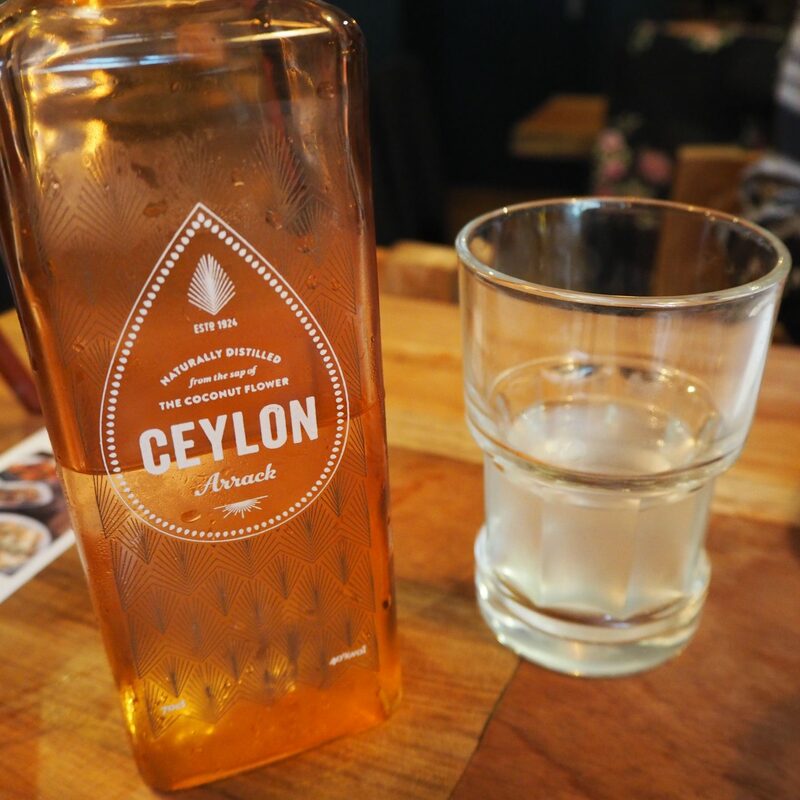 To drink, we had to try their coconut water which was really nice and the tap water comes in a reused Ceylon bottle which is quirky. We were really full after trying a variety of dishes but our curiosity got the better of us so we decided to split a Watalappam, the only Sri Lankan dessert on the menu. It is a coconut custard pudding topped with cashew nuts, described to us as a little bit like a Crème brûlée. 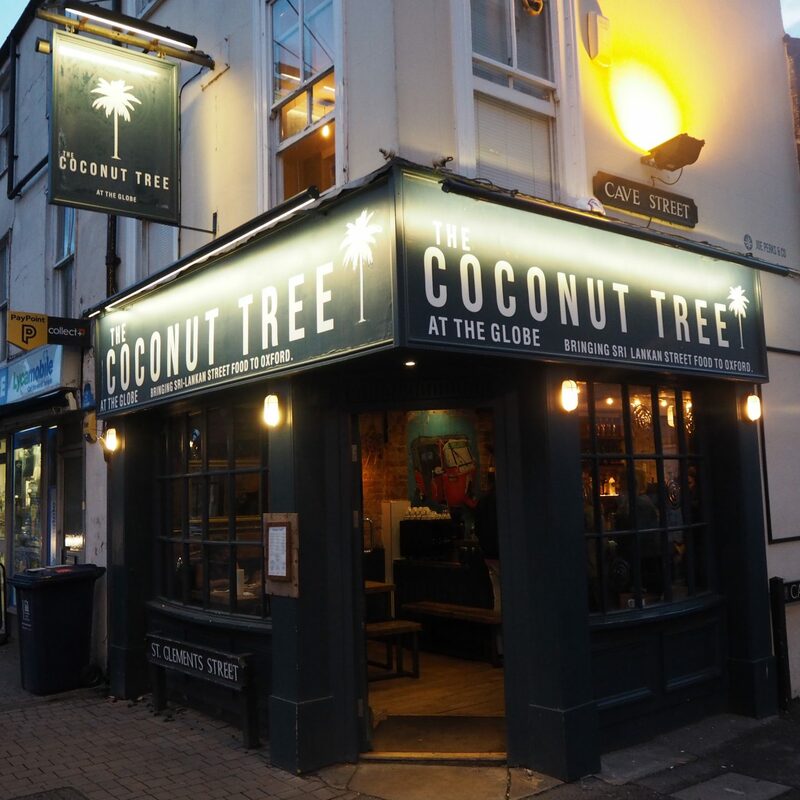 Overall, I would say that even though I have never tried Sri Lankan food, nor have I visited many tapas style restaurants I really enjoyed The Coconut Tree and feel that there isn’t anything similar in Oxford at the moment. They have spotted a niche in Oxford and smashed it. There is a reason why they are the number 3 rated restaurant in Oxford, it’s because people love eating something different to your standard Italian/Indian/Chinese food which is both high in quality and can be enjoyed in a casual atmosphere. The only couple of things I would say they could improve on, is that it was a bit hot inside (an easy fix with some air-con) and the staff could have popped by a little more often. All the waiters and waitresses were very busy which, to be fair, is a good thing! I couldn’t fault any of the food we tried nor the friendly and helpfulness of the staff when we were being looked after. I’d rate The Coconut Tree a 8/10 overall for our food/drinks/dining experience and will be back again for sure.